Spotted this bit of apostrophe abuse during our recent trip down to York, UK. Of course, the sign could be correct if that was Mrs. Scoop behind the counter. But then, why would the other signs just read “Scoops”? It could’ve been possessive… anybody? Bueller? But yes, that giant ‘S’ is god awful. Haha, I think the giant “s” bothers me more than the apostrophe. Heh, I didn’t even notice the fake Jamie in line there. I was too busy trying not to look like I was taking a photo of their sign! 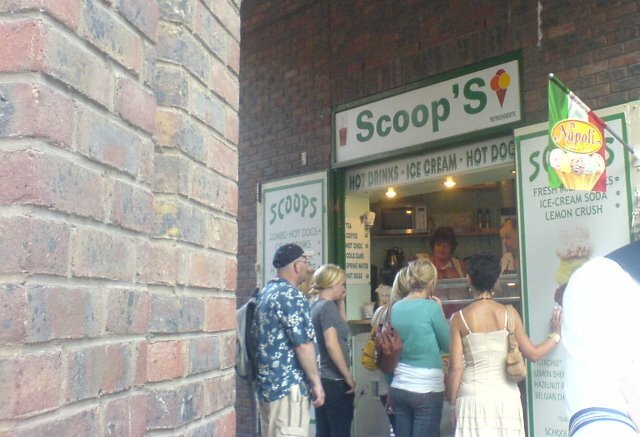 And what kind of ice cream is Jamie Hyneman in line to buy? And why is the second “S” giant? ?